I know many of you must have a serious sneer on your face just at the mention of omena. Omena sends fear, repulsion, and salivation in equal measure to different people across the country. Today’s recipe is nothing short of splendid. Really, you must try this out! Very Healthy indeed! Omena (omena in, Luo, dagaa in Swahili, mukene in Luganda) is a small silvery sardine-like fish that affords the same nutritious advantages. Some people eat them with tea in the morning, and others have them with Ugali and Sukuma Wiki (collard greens) for lunch or dinner. Whatever your option, just remember that they are good for you, and, cooked right, very tasty. ➧1 bunch chopped spring onions. ➧1 tablespoon garlic and ginger paste. ➧1 teaspoon cayenne powder (optional). I removed the heads but if you fancy them, you can cook like that when I washed the omena/dagaa/mukene with boiling water. 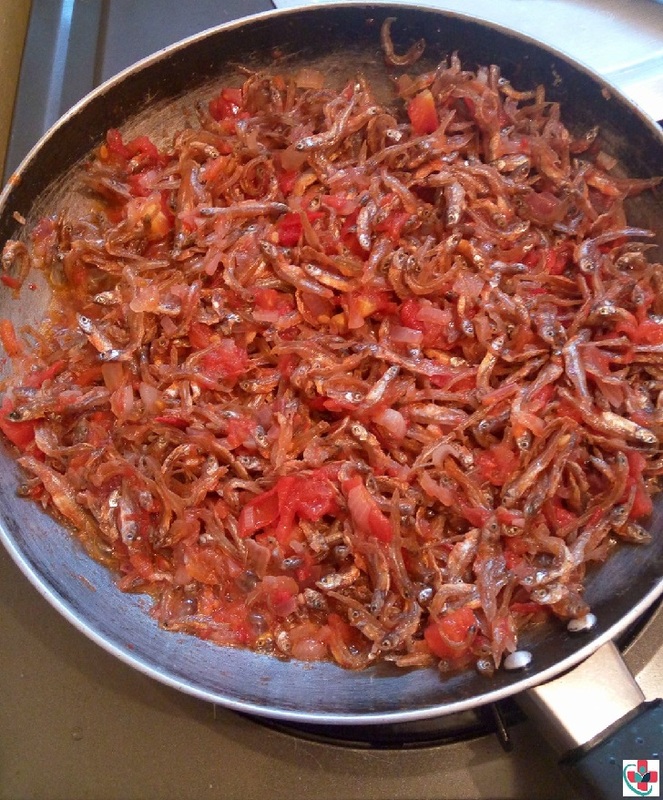 Heat some oil in a pan and fry the omenas/dagaa/mukene until browned, keep turning to prevent burning. Remove from pan and put aside. Return the same pan on the fire, add a little oil and fry your onions for like a minute then add the garlic paste and fry some more. Put your spices and fry until fragrant then add the hoho and tomatoes. Cook until the tomatoes have become a thick paste. Add back your omena/dagaa/mukene, at this point, you can add the lemon juice with a little water if you want a wet fry kind of thing like I did or add coconut milk. Serve with ugali made from wholemeal maize flour, omena curry with kales. Enjoy!